You are invited to join us for an afternoon of celebration as we honor those who have been part of making the nonprofit community in the western suburbs stronger than ever. Since 1986, the West Suburban Philanthropic Network (WSPN) has been dedicated to working with the area’s nonprofit community. Each year, WSPN recognizes a number of people, businesses, foundations and organizations that provide so much to sustain and enhance the rich philanthropic environment that is fundamental to the quality of life in the western suburbs. This year, WSPN recognizes such individuals and organizations in a variety of categories. We hope that you will join us in honoring these recipients by attending the 17th Annual WSPN Philanthropy Awards Luncheon. Tickets must be purchased in advance. Registration closes on May 11th! Sponsorships are available from $500-$5,000. Register with option "A" and when it asks if you're registering any Outstanding Volunteers as guests, click yes. Then list their names in the box below that in addition to adding them as guests within your registration. Important Note: If you are registering any Outstanding Volunteers you must list their names in the given box(s). If those individuals are only added as guests, we have no way of knowing they are an Outstanding Volunteer. Email WSPN Luncheon co-chair, Sarah O'Donnell at sodonnell@tritownymca.org to request an invitation or for more information. Click here to learn about becoming a sponsor. via phone (630) 407-6458 or email Shefali.trivedi@dupageco.org. Are your Board of Directors actively a part of your Fundraising and Philanthropy plans? Join fellow WSPN members on June 20th for a panel discussion from 3 regional not-for-profit organizations that reflect the small, medium, and large scales of successful board engagement in fundraising ideas and best practices. This panel will explore the practical approaches to build collective buy in with your board members for small and large fundraising goals, and how to best communicate and track involvement to get the best results. 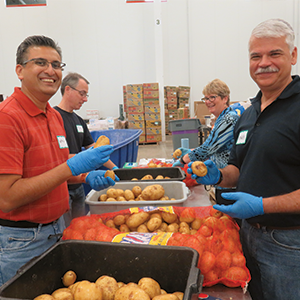 Special Volunteer Opportunity: Please note an additional registration is available to participate in a unique volunteer opportunity supporting the Northern Illinois Food Bank on site immediately following this program. Please consider extending your morning if possible and participating as a food bank volunteer from 10AM-11:30AM. Click the volunteer registration to learn more. Share some time with your fellow WSPN members this summer volunteering to help those experiencing food insecurity. Immediately following the June program at Northern Illinois Food Bank members of WSPN are invited to volunteer inside the food bank for an abbreviated volunteer shift. Become more familiar with the NIFB, and get hands on involvement with friends and fellow WSPN members from 10-11:30AM this June and share in the spirit of Philanthropy. Please note, a minimum of 10 members preregistered to volunteer are required to fulfill our shift obligation. Please sign up today!